Having your very own indoor turkey fryer for home use has a lot of advantages. You can have delicious homemade turkey any time of the year. You do not have to worry about the weather as your turkey fryer is meant for indoor use. The electric indoor stainless steel turkey fryer gift idea is awesome. The Masterbuilt 23011014 Butterball Indoor Gen III Electric Fryer Cooker Large Capacity with its stainless steel construction is certified safe for indoor use. Its thermostat temperature control feature as well as a cooking basket with drain clip together with its drain valve allows for easy usage and easy cleaning. You can easily fry up to a 14 pounds turkey, steam your vegetables or use it to boil seafood. 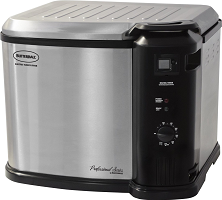 This Butterball indoor electric turkey fryer comes in large and x large sizes. There is also a package that comes with accessory pack. If you wish to cook a 20 pound turkey, then the XL turkey fryer model is the option for you. 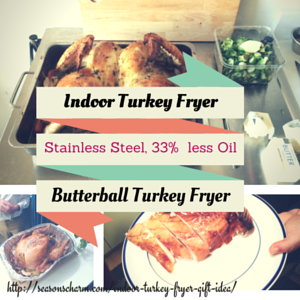 Compared to traditional turkey fryer, this Butterball indoor turkey fryer uses 33% less oil. The porcelain coated inner pot has a maximum oil mark so you can’t go wrong with the amount of oil needed. The oil gets heated up in 30 minutes with its 1650 watt heating element. A green light indicates the oil is ready to be used. Based on its 4 minutes per pound calculation, a 14 pound turkey can be ready in just under an hour. Think of the Butterball electric indoor stainless steel turkey fryer gift idea when its time for housewarming parties, birthdays or Christmas.